Wolf Bracket - Stonework - Up, up it goes! For round 2 of The Tourney. 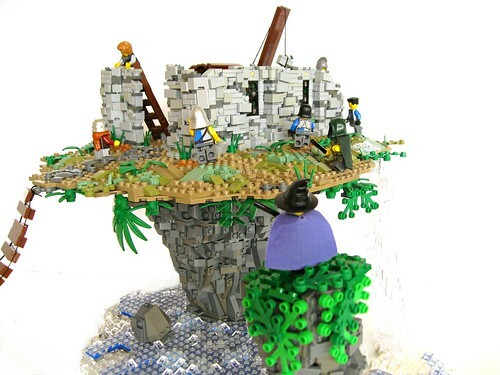 -The waterfall comes from a magically refilling pool, and the rock uses natural magic to balance. I find myself overlooking the sea, standing on a grassy, pleasant landscape atop a tall, precariously balanced rock. The wind blows at my back, blowing my hair into my face. I push it out of my eyes, only to laugh when it only falls back in front of them a moment later. Gremlon smiles. "You like this place?" he asks me. I nod. "How is the rock balanced like this?" I inquire curiously. The rock shouldn't be able to stay up like this; the base is only a few yards wide, not nearly enough to support a large area like this, especially with the forces of the water acting against it. "It's a mystery," Gremlon replies, shrugging. "Some say everything somehow was aligned perfectly and that it's ready to fall any minute. Others blame magic. However it stays up, it's been here for quite some time. "It's sorta like the waterfall in that way. The waterfall flows over the edge from a small pool that's never drained. I've heard a lot of explanations for it. Some folks try to explain it away with a bunch of science, claiming that water diffuses through the ground, or something like that. Me? I say it's magic. Natural magic is all around us. Some is more subtle than others, but it's there, whether you notice it or not." Magic... The word brings me back to the world, taking me away from my moment of bliss. "So, why did you take me here? What am I to learn here?" "Have you heard of the Druid's College in Hadran?" Gremlon asks. I nod; having lived in Hadran for most of my life, I know all about the city. The �college, ironically, is one of the few places I've never been to, but I certainly know of it. "The Druid's College is the main location where I teach my students. Some I teach privately, but I eventually take most of them to the college, where they can acquire a more diverse education by learning from other teachers in addition to myself. The college currently is unrivaled in Rainos; there aren't any competing schools, or at least none of significance. That was not always to be the case, however. "Many years ago, an childhood enemy of mine rediscovered me. He began stalking me, trying to find out anything he could so that he could use it against me. Naturally, he quickly learned of my position at the Druid's College. That's when he launched an elaborate scheme; he gathered dozens of powerful magicians and began to construct a university that could rival the Druid's college. If he had succeeded, our school might have fallen apart; he was building his college right here in Guaire, and Guaire is such a more popular area than Hadran. "I had to act. Day by day, I wove spells into the masonry, attempting to weaken the walls. At first, my efforts had no noticeable effect. The walls continued to look perfectly new. Nothing changed. "But one day, a breakthrough happened. 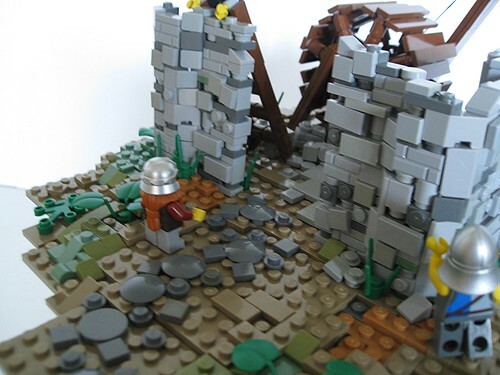 As the workers were constructing the building, the walls began to crumble. Stones began falling off, and within seconds the walls looked as though they were hundreds of years old. The workers were terrified; they abandoned the project, despite my enemy's protests. "My enemy died that night. He fell off a bridge when he was leaving the site. I tried to convince myself that it wasn't my fault. My spells had weakened the stone, not the bridge. But deep down, I know that it was my doing. Back then, my magic was imprecise. I must have accidentally caused the wood to weaken as well. "To this day, that memory continues to haunt me. It was the only time I've ever taken someone's life, and to do it by accident was horrifying. What scared me the most, though, was that in the days that followed, I tried to justify my actions. I told myself that he was an evil man, that he deserved to die. But he wasn't - that's the thing. It was a stupid rivalry. Neither of us ever did anything wrong. We just hated each other for some inexplicable reason. He truly didn't deserve to die. "In magic, there is more to learn than just how to cast spells. You must learn morality. You must learn, so that you do not make the mistakes that I �made." 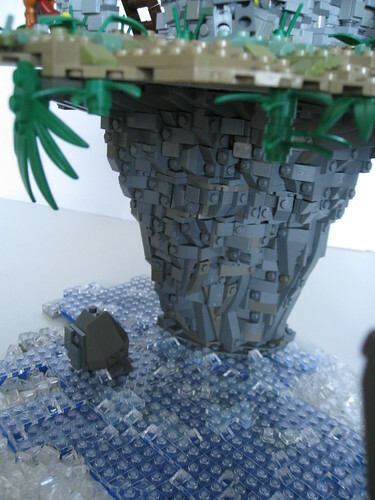 Despite what Gremlon said, it isn't magic - or even photoshop or clear supports - that holds this MOC up; it was just perfectly balanced on a very sturdy rock pillar. That's right - despite the complex textures of the rock, it's actually extremely sturdy - there's a solid brick core and some solid brick walls in the back that really help with that. The stonework turned out pretty well, I quite like the architecture of the building. I really like how the rocks turned out. The foliage hanging over the rocks turned out pretty well. The big rock is my favorite part though, I really love its texture and shaping. If you look at it the right way, you might notice that this whole section is supposed to look like an upside-down wizard hat submerged in the water. The treadwheel crane (yes, it really exists, ridiculous as it seems) turned out pretty well, I used ship steering wheels to create the round shape. Really sweet looking rockwork here, awesome entry! 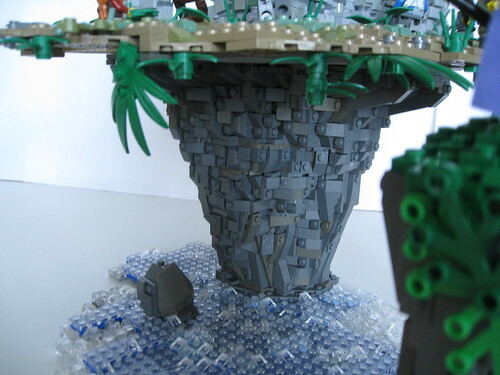 fantastic lego, well done ! The rockwork on those pillars is incredible! Amazing! The story was very well developed, the build itself was stunning, as always, and it just looked so awesome! Great job! Quoting Armon Russ *Cough* Natural magic? An oxymoron if I ever heard one. :P Anyway, the build is awkward-looking due to the 'naturally magicalness' of it. But there's some nice stonework and rockwork here. Overall, a well-built entry. Your story however, shows signs of 'dialog for the purpose of explanation' syndrome again, which isn't the most interesting thing to read. Most of it is the telling of Gremlon's past, of course, so I get that, but it would be much more interesting if there were some photos to go along with the story, which you most likely didn't have time for. :P Other than that, great work. The natural magic thing was inspired by some of the locations in Eragon - I forget what exactly they were, but there were several instances of magic occurring in nature that weren't controlled by magicians. The dialogue thing - ever told someone a story? :P I see what you mean about pictures, but it would have taken too much time, especially since the story takes place over a wide period of time (so I would have had to show the wall at different stages of construction, the bridge breaking, etc). Thanks! Wow. That is reall good. Nice job. Good luck! Quoting Soccer Socks Cool, it must be hard to keep it standing, is it? What is the other part of the rope bridge connected to? Cool, it must be hard to keep it standing, is it? What is the other part of the rope bridge connected to? Unique, but very effective! The rockwork is fantastic! This is seriously incredible! The shaping and textures and the rock are flawless. The masonry is also very well done! Incredible build! I take it you're joking, right? Sure, I definitely see floating castles under construction every day. Nothing new about that. 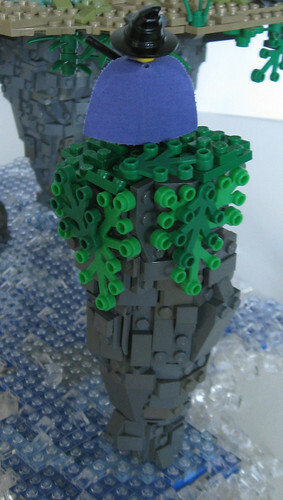 It does look average compared to your other MOCs. Not saying I don't like it though. Grandmas have ears. Quoting Halhi 141 Thanks Grahma! 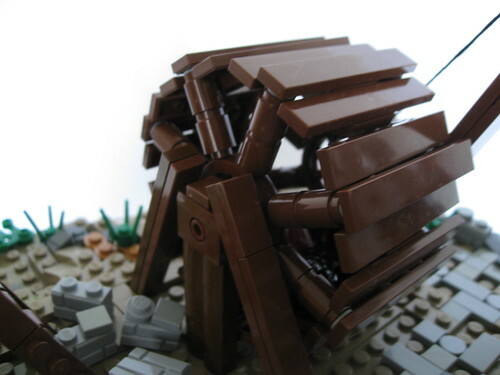 Quoting Deus "Big D." Otiosus This looks much more of an average castle MOC than what I have come to expect from you. To be honest I'm not entirely sure how to feel about this build. 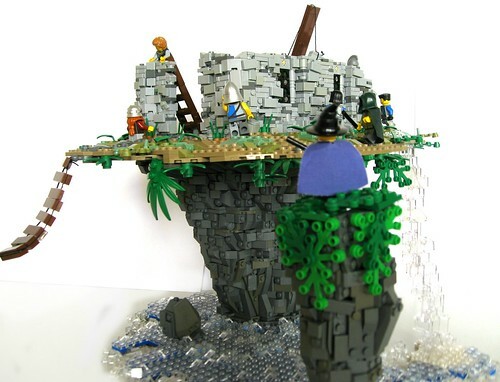 There are some great elements such as the rock pillar, the waterfall and the water and yet I feel if you just changed a couple small details it would make this build a lot better. The ground coming out from the pillar seems to have too much of an overhang and the construction project which should be the center of focus seems like a side thought. Just my opinion, though. Overall great MOC. Quoting Drew Johnson Yeah, I'm just shocked the thing is actually balancing. That's what I meant be the architecture. Quoting Professor B. eh... it's alright. Yeah, I figured :P Thanks! Yeah, I'm just shocked the thing is actually balancing. That's what I meant be the architecture. Quoting Alex Rode Too cool! I like the structural irregularity. Quoting Joe McGill Some of your best rockwork, and a nice storyline. Quoting Reese Hawthorne I agree with Thomas, you should have fanned the rocks out on the bottom. Great build nevertheless! Quoting Shevik Anderson Great job, Halhi!!! ;D Aye do I find your rockwork e'er so beauteous. :) Keep it up!! Thanks! What don't you like about the architecture? Quoting Graham Gidman This is awesome, just awesome! Well done, Hahli! Quoting Verticus Akkron This is really nice. Good story too. My only critique (if you could call it that; suggestion is more appropriate) is that I would use your second picture as the main image. It shows the rock craftsmanship a bit better. Either way, brilliant creation! Good luck. Quoting Stephen Boe Everything is awesome. I especially like the waterfall and ground textures and colors. I think the rock base could use some foliage hanging down, the solid grey is really monotonous to look at. Quoting Kai Bernstein Beautiful. Those rocks are awesome! Yay, the Kai vote of approval :P Thanks Kai! Whoa, this is brilliant! Spectacular work on this Halhi! *Cough* Natural magic? An oxymoron if I ever heard one. :P Anyway, the build is awkward-looking due to the 'naturally magicalness' of it. But there's some nice stonework and rockwork here. Overall, a well-built entry. Your story however, shows signs of 'dialog for the purpose of explanation' syndrome again, which isn't the most interesting thing to read. Most of it is the telling of Gremlon's past, of course, so I get that, but it would be much more interesting if there were some photos to go along with the story, which you most likely didn't have time for. :P Other than that, great work. 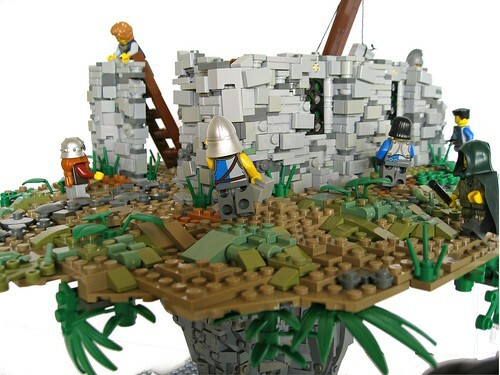 This looks much more of an average castle MOC than what I have come to expect from you. @ Halhi 141 thanks for the update! Note - for anyone interested, there's some much better photos of this on my flickr: https://www.flickr.com/photos/halhi141/ (first 4 photos). I'll embed them here after the round is over. Too cool! I like the structural irregularity. Some of your best rockwork, and a nice storyline. Quoting Thomas of Tortuga How about this: I don't like the overall shaping of the rocks. 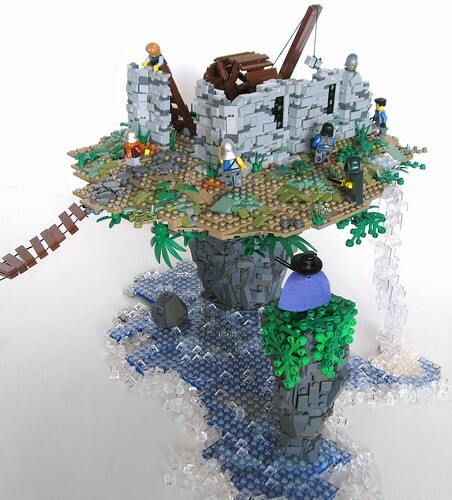 If you look at Cesbrick's island tower, his rocks go in a bit at the bottom, then flare out again to support the whole base. Your rocks just go straight out, and still don't fill the whole base. I can believe a rock held in place by magic. I can't believe that that whole slab of grass is just balanced on top like a plate on an ice cream cone. Rocks work that way, sure, but grass and dirt don't. Oh, I see your point, but that wouldn't have really worked for the Wizard's hat illusion. Great job, Halhi!!! ;D Aye do I find your rockwork e'er so beauteous. :) Keep it up!! I agree with Thomas, you should have fanned the rocks out on the bottom. Great build nevertheless! How about this: I don't like the overall shaping of the rocks. 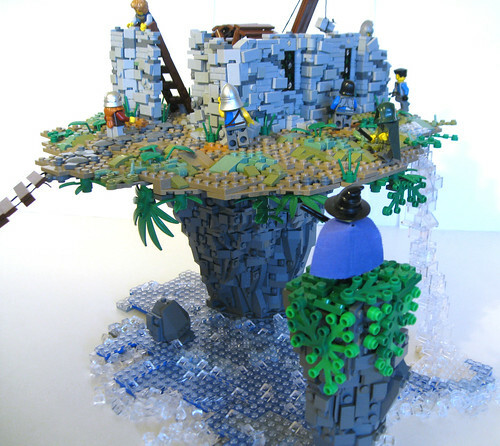 If you look at Cesbrick's island tower, his rocks go in a bit at the bottom, then flare out again to support the whole base. Your rocks just go straight out, and still don't fill the whole base. I can believe a rock held in place by magic. I can't believe that that whole slab of grass is just balanced on top like a plate on an ice cream cone. Rocks work that way, sure, but grass and dirt don't. That's funny, I seem to have remembered seeing you say something about liking it in my intro, but I suppose not. I love it personally though. Quoting Thomas of Tortuga Rockwork looks very detailed, despite being hilariously unrealistic. I like the stonework, though, that section looks a LOT more realistic than normal. Rockwork looks very detailed, despite being hilariously unrealistic. I like the stonework, though, that section looks a LOT more realistic than normal. This is awesome, just awesome! Well done, Hahli! This is really nice. Good story too. My only critique (if you could call it that; suggestion is more appropriate) is that I would use your second picture as the main image. It shows the rock craftsmanship a bit better. Either way, brilliant creation! Good luck. Everything is awesome. I especially like the waterfall and ground textures and colors. I think the rock base could use some foliage hanging down, the solid grey is really monotonous to look at. Beautiful. Those rocks are awesome!